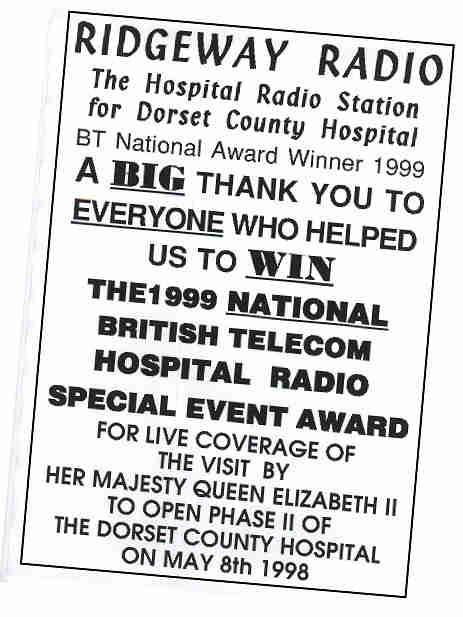 In the 1999 Hospital Radio Awards, sponsored by BT, Ridgeway Radio won FIRST PRIZE in the 'Special Event' category receiving £500 and a much coveted trophy. The competition is open to all Hospital Radio stations and is very keenly contested. Our entry featured highlights from our live outside broadcast of The Queen's visit to Dorset County Hospital on 8th May 1998. Her Majesty officially opened the complex following completion of Phase 2. Andy Worth, chairman, said "I'm immensely proud of all our team of volunteers who worked so hard to produce this winning entry. Coming as it does in the 50th year of our main sponsors, The League of Friends, it gives us double cause for celebration." Colin Powell, Chief Executive of the Hospital Broadcasting Association said the entry was "very professionally put together and well covered. The original live programme from which this entry was compiled involved everybody in the hospital, from patients to staff and visitors. That is what Hospital Radio is all about."